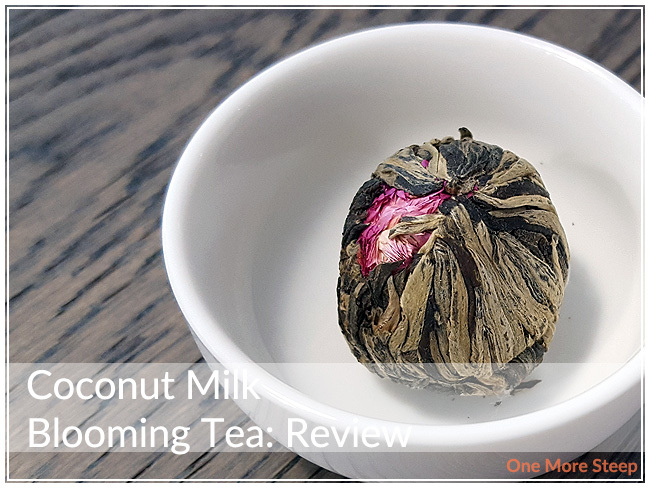 Fox Tea Club has provided me with Coconut Milk Blooming Tea for the purposes of providing an honest review. I adore blooming teas – it’s a bit like a mix of tea and art together. 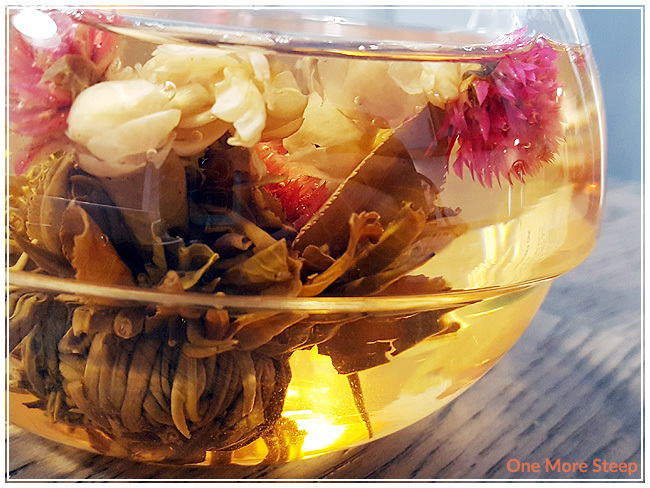 For those new to blooming teas, the tea leaves and flowers are tied together and when you first get it the tea is just a ball. 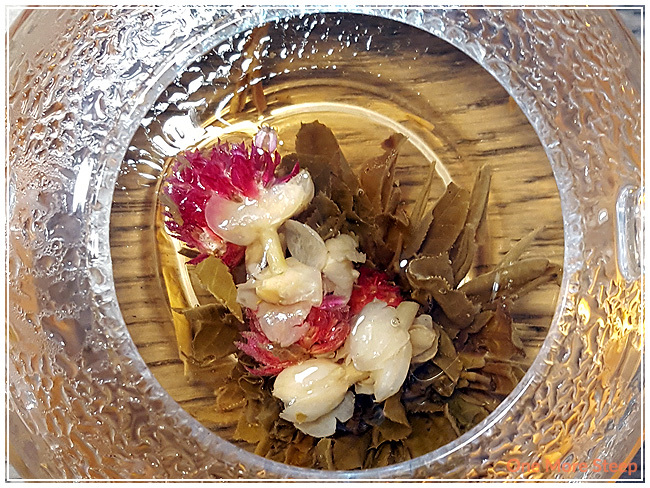 After steeping, the flower and the tea opens up and it’s a beautiful arrangement in your tea top. I would definitely recommend steeping all blooming teas in a clear glass teapot or cup to get the full effect. That said, Coconut Milk Blooming Tea came to me in sample packaging from the Fox Tea Club. I received one tea ball from them and it smells incredibly like coconut with a hint of floral. There is not much that I can see beyond the tea leaves and a hint of pink from the clover flower. The ingredients for the Coconut Milk Blooming Tea are: clover flowers, jasmine, white tea. The description of the tea also includes coconut flavouring, but the ingredients list (at the time of writing) does not. Fox Tea Club suggests using 1 ball in a clear teapot and to steep using 180°F (82°C) water for 5 minutes. I followed the steeping instructions for the initial steep. After the 5 minute steep, the Coconut Milk Blooming Tea has opened up quite a bit. The tea itself has a warm pinkish tone to it, I believe that is from the pink clover flowers. The tea smells of jasmine and coconut, and just has a hint of sweetness to it. I’m pleasantly surprised at how good this tea taste. 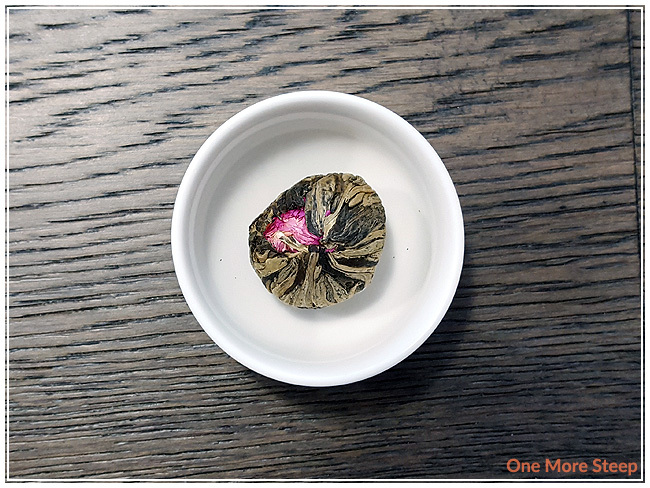 It has a soft floral taste to it that I’m attributing to the jasmine – it’s much more vibrant than other jasmine teas I’ve had before because it’s present rather than only being used to scent the tea. The coconut flavour is sweet and quite strong, it holds itself well against the strength of the floral notes from the jasmine. The sweetness is not over-the-top, and it’s just enough to make it interesting. I would think that most people wouldn’t feel the need to add any sweetener to this floral tea. 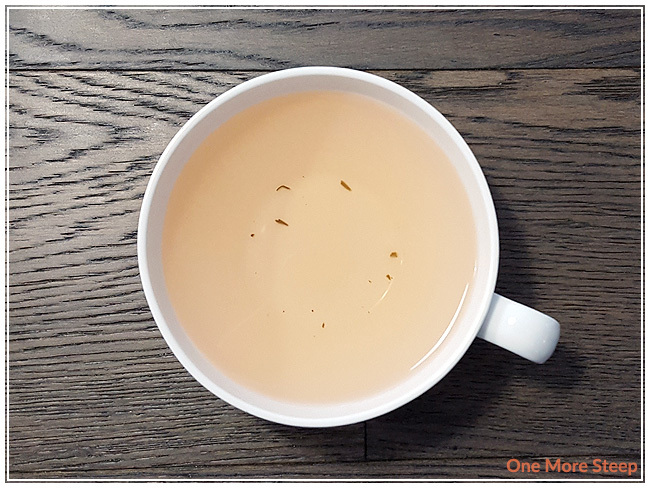 Fox Tea Club suggests that the Coconut Milk Blooming Tea can be resteeped 3 to 5 times, which always makes me excited to hear because I love resteeping teas – you find subtle flavour changes from time to time. I used the same temperature water, and increased each subsequent steep by 30 seconds. For the first 2 resteeps, I found that the coconut flavour was a bit weaker than the initial steep, but it was still quite good. By the third and fourth resteep, I found that the jasmine flavour was considerably stronger than the coconut, as the flavouring of the coconut had started to become weaker. It still has a touch of sweetness though. I didn’t find my last (fifth) resteep to be particularly good compared to the other steeps, so for me the Coconut Milk Blooming Tea was good for a total of four resteeps (five steeps total). 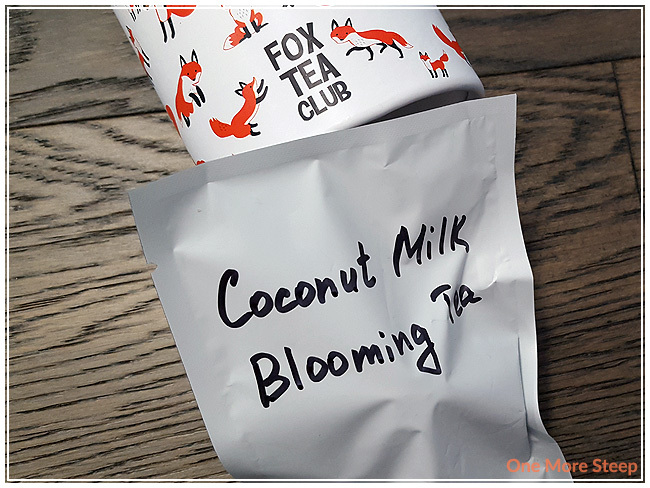 I loved Fox Tea Club’s Coconut Milk Blooming Tea. Not only was this tea fun to watch while it steeped, it also tasted really good. The coconut flavours were sweet and balanced well with the floral notes from the jasmine. I enjoyed the fact that this tea resteeped well and the changes in the flavour were subtle with each resteep. 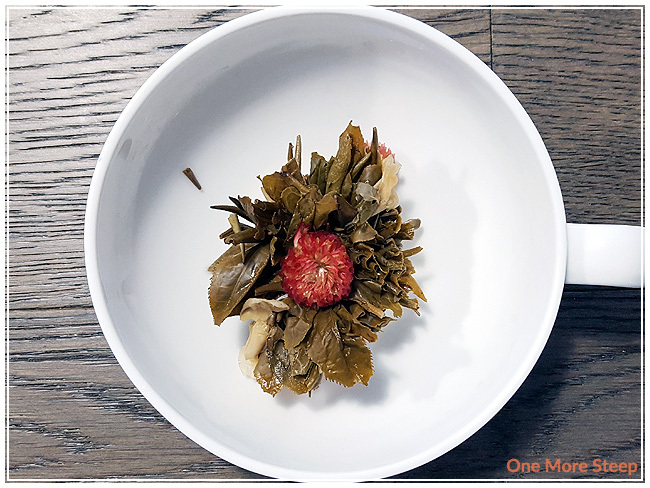 It’s a fun tea, and I think that blooming teas are best enjoyed with company – especially people who’ve never seen a blooming tea open up before.